By law, all citizens were required to help with the war effort. On August 6, 1945, the building removal work was being carried out by mobilized students, a bit older than junior high school students today, as well as groups of adults who were organized according to area of residence or place of work. 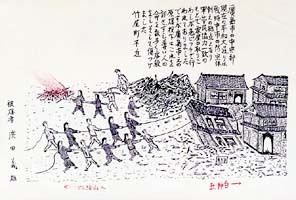 Many of the people involved in this work were killed by the atomic bomb. An exhibition held at Hiroshima Peace Memorial Museum in 2004 offered a death toll of approximately 5,900 mobilized students, perishing at the sites where they were helping to dismantle buildings.